After successfully baking my very first chiffon cake - Banana Chiffon Cake. I straight got hooked to this new method of baking cake. All the while I will just bake butter cake and cupcakes or muffins. As mentioned in my previous Banana Chiffon Cake post, I don't bother to learn baking chiffon cake as we can easily get them in the supermarket or morning market. But, after all I don't think we can get the banana flavour, chocolate marble chiffon, green tea flavour etc..etc.. out there, right?.. I think I have found a chiffon's cake master - Kitchen Corner, most of the chiffon cake she baked turn out fantastic and I hope to try out all her recipes. What attract me to try out her recipe beside viewing on her yummy cake pics is her chiffon recipe without the use of baking powder, soda bicarbonate or the cream of tartar. Amazing right??? I always limit the use of flavour essense or food colouring in all my baking. I got excited when I know I can bake a cake without baking powder and cream of tartar. Simply interesting right?? and,.. the cake turn out GREAT! Soft and spongy, not too moist or too dry. It's just perfect! I modify the recipe from Kitchen Corner to fix my size 23cm cake pan. I reduce some sugar as I still found it is still a bit sweet. Guess what, I bake this Chocolate Marble Chiffon twice in one day. My first cake all gone in 30mins time. I give half of the cake to my mother in law. My kids each had 2 slices for breakfast. As I wanted to give some to my parent as well, so I bake another cake...hehe! The second cake turn out with even nicer marble pattern or effect... yeah!! I can bake it very well already~ hahaha! Oh well, practice makes perfect right? teehee.. Cream ingredient (A) with hand whisk till sugar dissolved. Add in ingredient (B) in respective order and mix well before adding the next item. Fold in ingredient (C) and mix till no lumps. Divide the egg yolks mixture into two equal portion in two separate mixing bowl. Mix 10g flour into one of the egg yolks mixture and 10g cocoa powder into the other bowl of egg yolks mixture respectively. Mix well till no lumps. Beat egg whites in a clean large bowl until soft foam. Gradually add in sugar, one tablespoon at a time and finally add in corn flour. Mix well. The egg whites mixture should be peak foam, smooth and shiny. 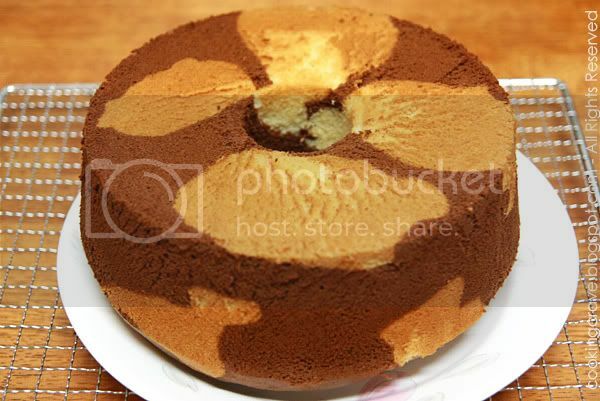 To assemble the marble effect: Spoon in the plain batter to three or four different corner of the 23cm cake pan, then continue to cover the plain batter with cocoa batter. Layer by layer till the end. Bake at preheated oven at 170c for 35-45 minutes or till it's cooked. Invert the cooked cake immediately on a wire rack until it's completely cool before remove the cake from cake pan. Hey, you've make it even better!! Well done!!! Beautiful! Kitchen Corner: Thank you so much for sharing the recipe. 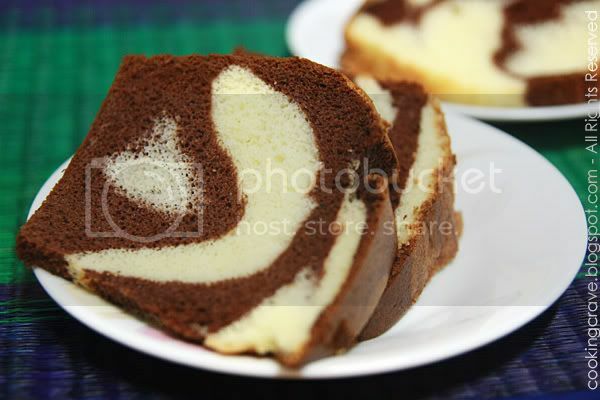 Tracie: I always love to bake marble cake and looking forward to see how the marble effect turn out. That is a very beautiful chiffon cake, actually I have never bake chiffon cake before, but I just bought a chiffon cake mould and going to try out my very 1st chiffon cake. I hope you could quickly publish the recipe, so I can give a try. Thanks in advance. The marble effect very beatiful. I like it. Thank u very much on sharing this lovely recipe, I will try by this week. Lay Yin: Hey girl, how are you? Try it and you'll love it too I think. Small Small Baker: Thank you, I'm still newbie in chiffon cake. Wish to try out more other flavour as well. Jen Jen's Palace: Thank you! That chiffon looks fantastic! Can you send me a piece please? Hi TinTin, I have passed you the 'Kreative Award'. Do check my blog to see what it's all about. Thanks for the great recipes you've shared. You have nice blog and interesting recipes. Will visit often and also link you to my blog. i am so impressed with the marbling. I've tried this before and it never looks like that. Anncoo: Thank you & welcome to my Blog! Rita: Haha..Thank you so much girl. Justin: Thank you. I was lucky that it turns out so nice. I don't think I can get the same effect on my next bake. Hi, This is a beautiful cake!!!! Looks yummy too. I was wondering how you made the conversion from a 21cm to a 23cm chiffon pan since I would like to bake this in a 18cm chiffon pan. wow ur marble chiffon is soooooo beautiful! mind sharing around how many eggs are use? 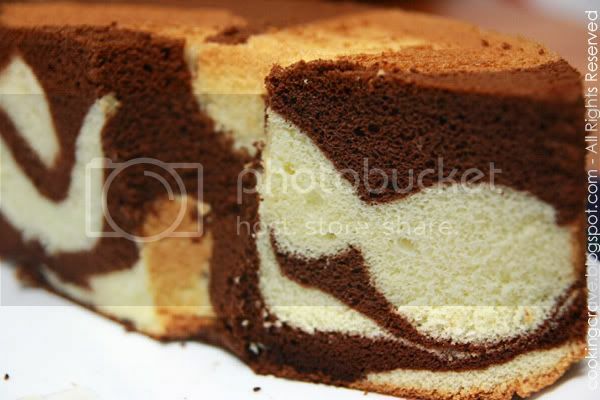 The photo of your Chocolate Marble Chiffon Cake is spectacular. I'm curious about the use of corn flour instead of cream of tartar when beating egg whites. You made that switch in the Pandan Chiffon Cake recipe. What is the reason for doing that? Hi Okapaka, there is no other reason than I feel that using corn flour are more convinient.. anyway, we can always use the cream of tartar if you have it at home :) Happy Baking !! Thank you TINTIN for answering my question re corn flour vs cream of tartar. 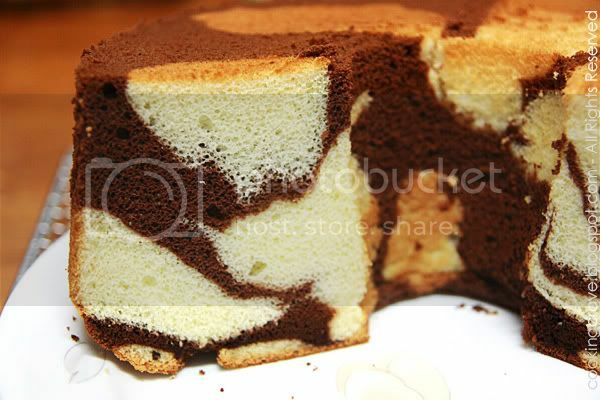 I'm inspired to bake the Marble Chiffon Cake each time I look at the beautiful pictures you posted. Need to resolve conversion issue before I can proceed. It's a joy to visit your culinary blog. You're welcome Opakapaka :)) Last time when I made this cake one by one I cracked the eggs and weight it .. your conversion might be useful to me too .. hee! !